The Cold View is the Drone Doom / Funeral Doom Metal project of A.A.S.. The Cold View plays slow Funeral Doom Metal with deep growls. Even though The Cold View has developed it's own style, every fan of Esoteric, Thergothon, Ahab, Shape of Despair, Evoken, Skepticism or Mournful Congregation should check it out. The third concept album Wounds with more than 70 minutes running time got finished in the second half of the year 2016. With Wounds the final chapter of the album trilogy got completed. The new album deals with the emotional injury and healing of a human being. The first two albums took a personal and a neutral perspective. Now the cold view is directed outwards to the fellow human beings. Musically and compositionally the 6 songs of the third album are the most dynamic works of The Cold View. The first two albums Wires of Woe, Ways of Waste and Weeping Winter were released as CD digipak and as digital download on Bandcamp. Other highlights in the history of The Cold View are the collaboration with the Funeral Doom legend Pantheist and the split-album Songs of Deepest Skies with the French project Abysmal Growls of Despair. The Cold View is dedicated to Funeral Doom Metal with an underlying share of Drone buzz. Deepest growls, desperate keyboard passages and oppressive guitars form a sound that is urged to emphasize the hopelessness of the human existence which has been torn off from the world of nature. Limited CD digipak and digital release including all artwork available at Bandcamp page of The Cold View. 11. Mar 2017 - Impressingly great review at Doom-Metal-com! "It's cleverly done and well-executed, offering a very effective balance between challenge and reward throughout, and a distinct stride forward for the band. Highly recommended, even if Funeral Doom isn't generally your thing." 01. Feb 2017 - Third album out now! 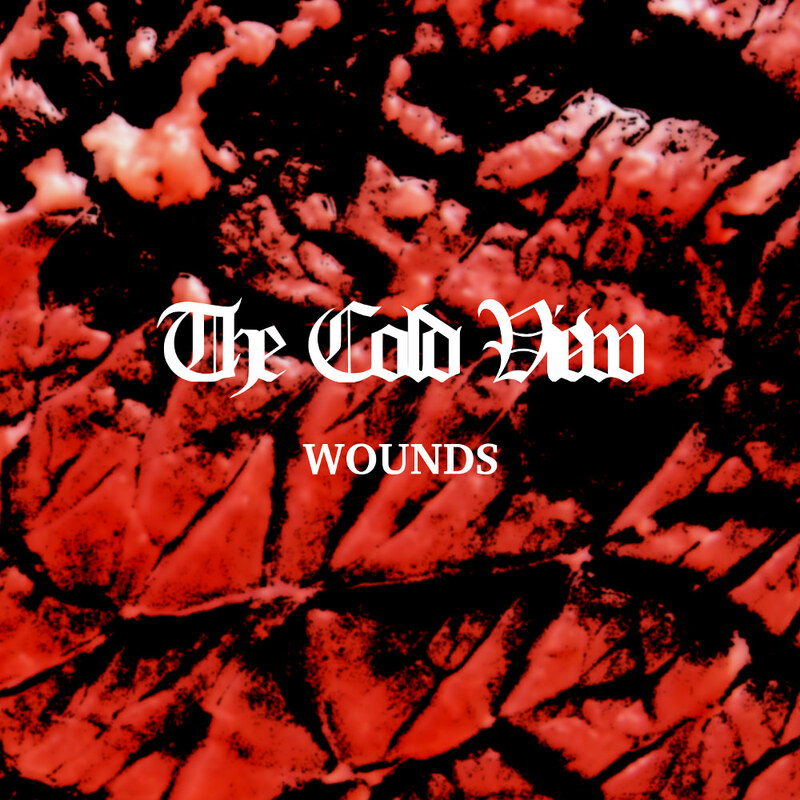 The third album "Wounds" of The Cold View is out now. You can get it as digital release and limited CD digipak at Bandcamp and GS Productions store. I would like to thank Vitaly of GS Productions, C.H. and J.L. of blockstudio Berlin and all supporters of The Cold View so far. "[...] listeners of funeral doom are getting exactly what they want from this slightly experimental funeral doom album." 17. Jan 2017 - 8 out of 10 points for the new album! (...) Grenzen werden hier musikalisch düpiert, um die Gefühle und das Seelenleben des Hörers bei aller Gestörtheit zu malträtieren. (...): Zephyrs Odem. Are you already curious about the new album? GSP Magazine has made a promo video for the second song: https://www.youtube.com/watch?v=mwN7PV7EyHI. You can already preorder the album at bandcamp. The third album "Wounds" will be out at the 1st of February 2017 as digital download and CD. The limited digipak will get released by GSProductions. You can already preorder the new album at Bandcamp. The new concept album has a running time of over 73 minutes and features 6 songs. If you still don't have the record, there are some copies of the beautyful A5 digipak left. You can order the digipak or the digital version at Bandcamp! The interview is dealing with the band history, inspiration, background of the music and my thoughts on illegal downloads and the music industry. 20. June 2015 - Limited digipak now available at The Cold View Bandcamp page! I have received my copies of the new split "Songs of Deepest Skies" with Abysmal Growls of Despair. You can now get them at https://thecoldview.bandcamp.com/album/songs-of-deepest-skies-split. Please note that the label shop of Frozen Light is already out of stock - the very classy limited digipak is already sold out there! 13. June 2015 - First review for the new split "Songs of Deepest Skies"
05. June 2015 - New split release with Abysmal Growls of Despair out now! The split album Songs Of Deepest Skies by my project The Cold View and the Funeral Doom band Abysmal Growls Of Despair from France is released today! Four dark, hopeless and impossibly beautiful songs of twilight and off-color clouds up in the skies. Nearly 60 minutes full of sorrow, despair, cold heaviness and severe strength. For this release I created my longest song so far - over 32 minutes Funeral Doom and Drone including surprising twists and turns. 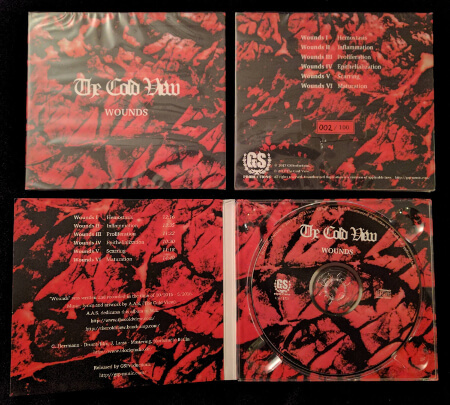 Available as beautiful A5 digipak limited to 99 hand-numbered copies and digital release at https://thecoldview.bandcamp.com/! Here comes another very well written review in German, posted at the fine blog Der Schwarze Planet. You can find a translation at the Facebook page of The Cold View. Polaris of Vendetta Metal Magazine from Finland has written an interesting review focusing on the emotional impact of the second album and stylistics of each track. "There might not be any album in the history of recorded music that wants to be in your record collection less than _WWWW_ does. [...] _WWWW_ resists snap judgment, and it refuses to give you anything you want. Either give yourself up to what it is or give up and go away." Here comes a new 8 out of 10 points review for the re-release of the debut album "Weeping Winter" by Vendetta Metal Magazine from Finland. It is an interesting read. The author combines the description of his personal emotions while experiencing this Funeral Doom record with his objective evaluation of the music and compositions. I have made a big redesign of the official website. As you can see at the site, the logo has changed again. So you know, that something is coming... The website is now fully responsive on every device and every screen and has it's own section for every type of content. "The Cold View's sophomore is about as slow, tortuous, deliberate and unrelenting an album as any out there." The last days I was hiking through the Elbe Sandstone Mountains in Germany near the Czech border gathering spirit and power for the coming days where I will work on a new The Cold View song. "Ein sehr spezielles Werk erwartet mit 'Wires of woe, ways of waste' den interessierten Hörer. Eine Art klanglicher Tonverfall, bedrückend, atmosphärisch dicht, aber auch verstörend gut!" 5. Sep. 2014 - Kostas of Pantheist about the song with The Cold View! As some might have noticed The Cold View had the opportunity to participate on the Drone song "Warping the Space-Time Continuum" by Kostas Panagiotou of Pantheist. Many thanks again for the honour! You can download the song for free at the Pantheist web site. Kostas is saying about the collaboration: "A few words about the track 'Warping the Space-Time Continuum' that accompanies the third chapter of the concept story. It is a drone piece recorded with the help of A.A.S. from The Cold View, a funeral/drone project from Germany which just released its second album. The track features church organ, drone guitar, keyboards and samples of Russian basso profundo singing. as ever, we are grateful for the collaboration and thank A.A.S. for the time and (dark) energy he invested in this recording." And here is another great review for the new The Cold View album by the German Metal webzine Undergrounded: "Ich weiß nicht, ob man "Wires of Woe, Ways of Waste" so einfach mit einer Punktezahl beurteilen kann und ich will mir dies auch nicht anmuten, zu tun. Denn die Art und Weise der Musik ist zu zweischneidig und kann nicht einfach in gut oder schlecht eingeteilt werden. Es ist in meinen Augen ein sehr gelungenes Gesamtkunstwerk, welches mich emotional voll gepackt und gebannt hat." If you haven't already checked out the first two chapters and their related songs, I strongly recommend you to do so, too. A huge thanks to Kostas for giving me the opportunity to work with him. It was a great pleasure! 24. Aug. 2014 - New well written review for "Wires of Woe, Ways of Waste"
The Cold View got the personal copies of the debut album re-release. If you want to get one of these limited CD digipaks including an exclusive bonus track you can get one at the official bandcamp page. If you would like to buy some other great music as well, you could also head over to the GSP shop http://gsp-music.com/gsp49. 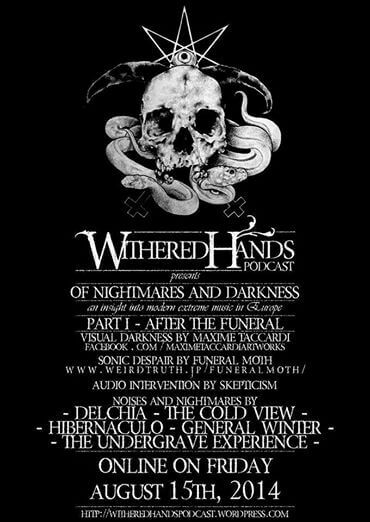 The Withered Hands podcast about the European Funeral Doom underground is out. Including an intensive interview with Skepticism and music of some Doom bands. Also The Cold View has an appearance with a song of the new album. A new review is out at the German webzine Metalglory.de. 8,5 out of 10 points! "Wires of Woe, Ways of Waste setzt den Weg des Debüts Weeping Winter fort und verfeinert diesen sogar noch. Was in diesem Bereich gar nicht so einfach ist, ist The Cold View auf dem neuen Album gelungen. Nämlich einen gewissen Grad an Abwechslung in die Musik zu transportieren ohne dabei das Gesamtbild des Albums aus dem Gefüge zu heben." The re-release by the Russian Label GS Productions comes as CD with 6-panel digipak, adapted artwork and a new song as bonus track. Even though the new song was written and recorded in 2014 it seamlessly fits into the concept of the album. The bonus song "Severe Winter" (12:26) thematically is the retrospective of the five original songs. The digipak is limited to 100 items and you can get it at the GS Productions Shop. The shop is available in English and Russian. The first review for "Wires of Woe, Ways of Waste" online, 8 points out of 10! If you prefer to watch some artwork by listening to the new album "Wires of Woe, Ways of Waste" you could go to the updated YouTube page of The Cold View. The second album is now out on Bandcamp, too! You can stream and buy "Wires of Woe, Ways of Waste" here: http://thecoldview.bandcamp.com/. Also the limited digipak CD will be available there soon. You can also get the digipak at the Endless Winter shop. I am very proud to inform you that my second album is out on Endless Winter today: http://endless-winter.org/endless-winter-news-eng.html! 12 Jul. 2014 - Artwork for the new album "Wires of Woe, Ways of Waste"
Some might have noticed the artwork for the new album. The pictures were taken at Darmstadt (the place where I exist), Erfurt (my home city), Berlin (where I prepared the recording and where mixing and mastering took place), Étretant (France, last year's vacation) and Knokke Heist (near Brugge, Belgium, vacation two years ago). All pictures were taken in the mood that led to the new album. You can see it at the artwork section of the website. I am happy to announce that my first album "Weeping Winter" will get re-released by GS Productions on CD this August. The album will come as 6-panel digipak with adapted artwork and with an exclusive bonus track. Although the new song "Severe Season" (12:26 minutes) was written and recorded in 2014 it seamlessly fits into the concept of the album. The bonus song thematically is the retrospective of the five original songs of "Weeping Winter". Also don't forget that the new album "Wires of Woe, Ways of Waste" will get released by Endless Winter soon, too! We sign the German one-man band The Cold View for the release of the second full-length album. The new album "Wires of Woe, Ways of Waste" will get published this summer as a limited edition of 200 copies in digipak, supplied with a 8-page booklet. The Cold View is dedicated to Funeral Doom Metal with an underlying share of Drone buzz. Deepest growls, desperate keyboard passages and oppressive guitars form a sound that is urged to emphasize the hopelessness of the human existence which has been torn off from the world of nature. The new concept album represents the extensive epic painting narrating about the loss of identity in the modern world, about the alienation which is born out of a technocratic material civilization. The previous work of The Cold View was published as an digital release and met the positive responses of listeners and specialized webzines. I am very happy with the master of the new album. JL of Blockstudio in Berlin did a very good job!. I had an intense listening to the intermediate result of the mix for the new album. It is sounding really great! Great work by Blockstudio from Berlin! Just a tiny bit of tweaking needed for the first two songs. The third track is finished. The second The Cold View album will be named "Wires of Woe, Ways of Waste" and will feature the songs of the same kind: Wires, Woe, Ways, Waste. The album will get a total running time of over one hour. The fourth song is in the making! In January the first album cracked the 2.500 downloads mark and was downloaded from 48 different countries. If anyone wonders about the work progress of the second album: I am happy with the first song and working for some days now on the second one. The first results are very satisfying!